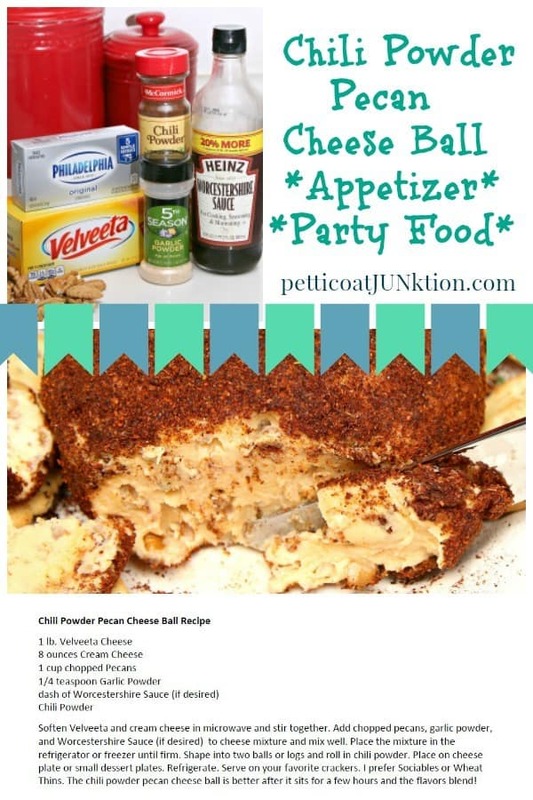 The chili powder pecan cheese ball is a family favorite and I make it every year for the Christmas holidays. I make a bunch of appetizers during the holidays. The JTS and I often have the appetizers for meals instead of having a regular meal, we’re bad like that. I made our annual cheese ball last week and it’s almost gone. Soften Velveeta and cream cheese in microwave and stir together. 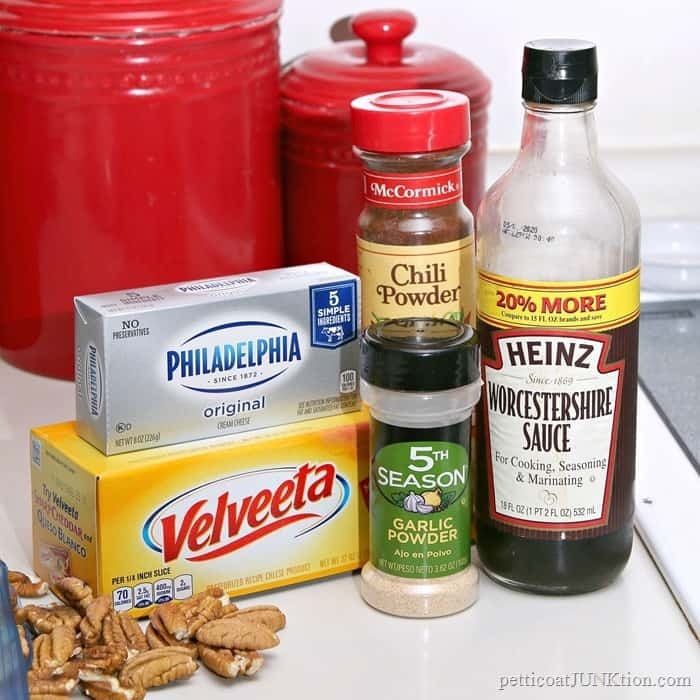 Add chopped pecans, garlic powder, and Worcestershire Sauce (if desired) to cheese mixture and mix well. Place the mixture in the refrigerator or freezer until firm. 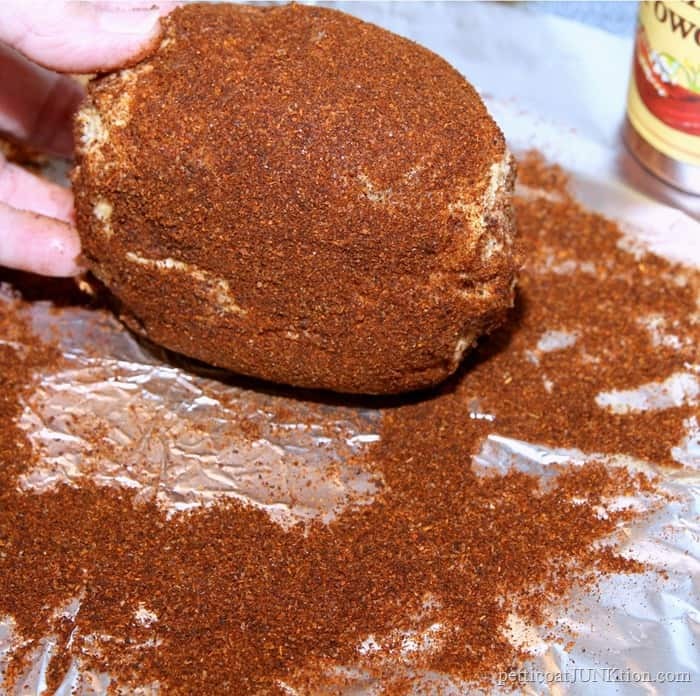 Shape into two balls or logs and roll in chili powder. Place on cheese plate or small dessert plates. Refrigerate. Serve on your favorite crackers. I prefer Sociables or Wheat Thins. 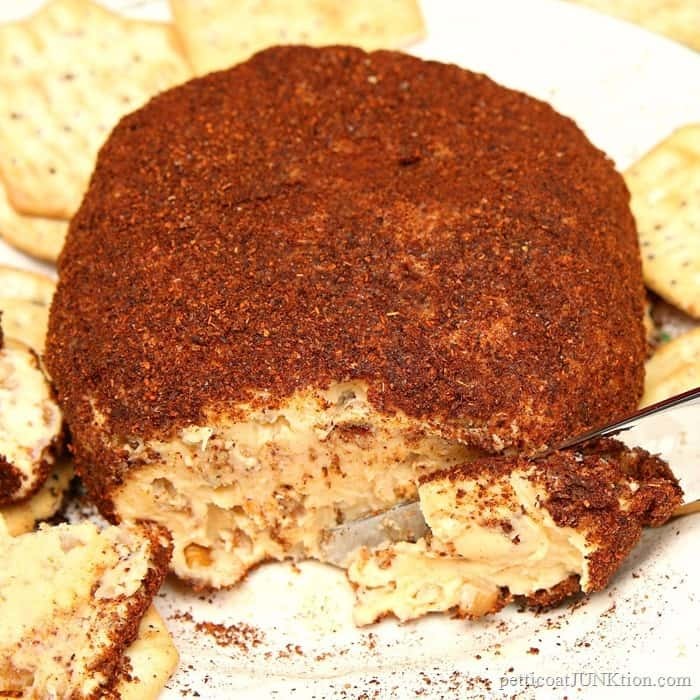 The chili powder pecan cheese ball is better after it sits for a few hours and the flavors blend! 1. Soften the Velveeta and the cream cheese in the microwave using the low power or soften setting. My microwave doesn’t have a soften setting. Mix the cheeses using a spoon until they are well blended. 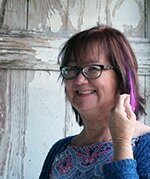 The original recipe says to soften and mix with your hands but I don’t like to do that. 2. Chop the pecans. I use a small electric chopper I’ve had for years. It’s handy for small jobs. 3. 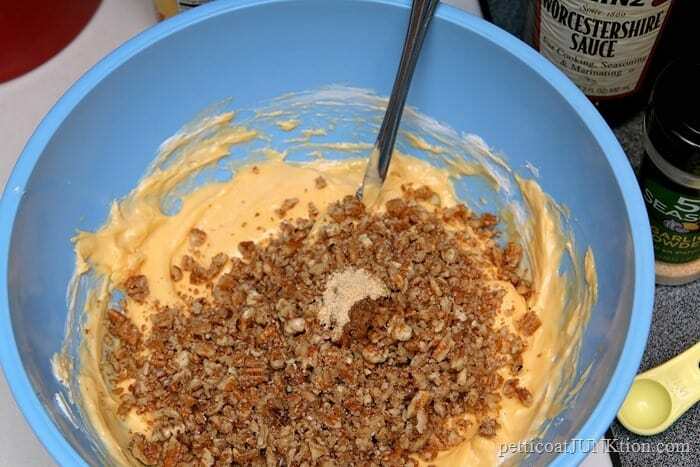 Add the chopped pecans and remaining ingredients to the cheese mixture and mix well. Cover the bowl with aluminum foil and place it in the freezer or refrigerator until the mixture firms up enough to make into balls or logs. 4. Pour the chili powder on aluminum foil or parchment paper creating a thin layer large enough in size to roll a cheese ball. 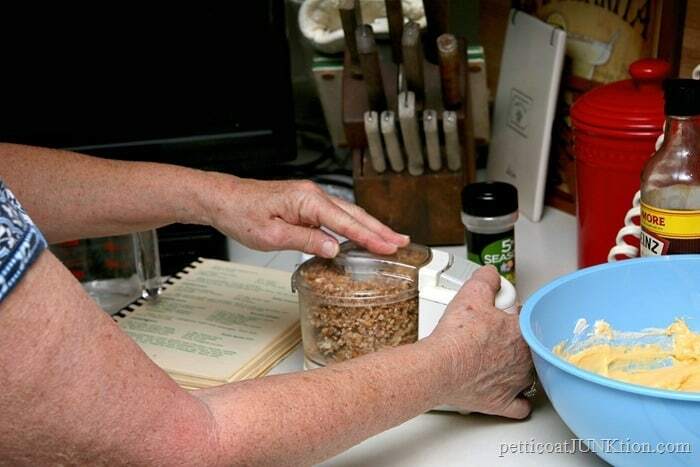 Form cheese mixture into balls or logs and roll in the chili powder until completely coated. I make two cheese balls ( or kind-of fat patties) and place them on small dessert plates. You can also just make one large cheese ball and place in on a covered cheese tray. I don’t have a cheese tray. I think making the smaller logs or balls works better because when sliced to serve on crackers you get the chili powder in every slice! 5. Serve on your favorite crackers. Keep refrigerated. You guys might want to make the cheese ball for the upcoming holiday weekend. It’s yummy! I shared my wonton appetizers a couple of years ago and they are still a favorite. I made them last week too. You can find that recipe here….Wonton Appetizers. 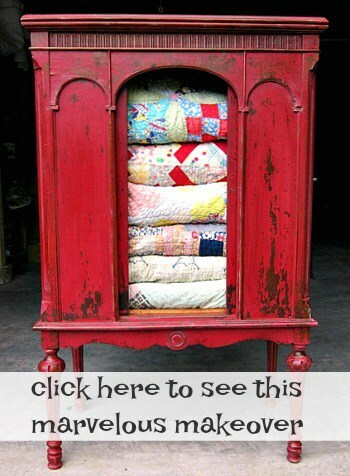 Find the electric chopper and my other favorite things at Shop Petticoat Junktion on Amazon.